As promised, we ran some synthetic benchmarks on the Oppo R7 and here are the results. Bear in mind that the unit we had at our disposal in not final yet, so, some performance drops are expected. Also, as it turns out, only the bigger Oppo R7 Plus will have Android Lollipop at launch. For the time being, the R7 still runs on the Android 4.4 KitKat, but it's got the latest Color OS 2.1 on top. The Lollipop update however is already in the works..
Also, we didn't quite manage to run all of our regular tests on the said unit, but we still have enough to work with. We picked quite a diverse array of contenders for the R7. In one group, we have devices, running the same Snapdragon 615 chipset. As previously mentioned, this is essentially an upper mid-range processor and it definitely performs accordingly. These include the Samsung Galaxy A7, HTC Desire 820, Sony Xperia M4 Aqua and the ZTE Blade S6. 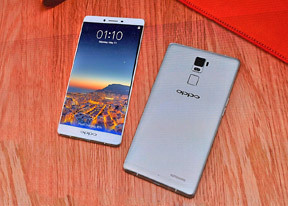 Still, The Oppo R7 and especially the bigger and pricier R7 Plus do contend to be high-end devices and, as such, we have also included the Galaxy S6, HTC One M9 and LG G4, to see, how it fairs among other flagships. Last, but not least, we set out to see what else is available around the $400 price tag of the R7. The rest of the included phones, phones, generally fall under this category. Currently, we have two allround test available - GeekBench 3 and Basemark OS 2.0. It both scoreboards, the Oppo R7 sits comfortably, where you would expect to see a Snapdragon 615 device. Interestingly enough, in both instances the phone is outperformed by the Galaxy A7, which runs on the exact same chipset. This could be a matter of optimization. Next up, we have GFX graphics test. The Oppo R7 is equipped with an Adreno 405, which is by no means a powerhouse, but still gets the job done. Performance, once again, is just as we expected. Onscreen and offscreen performance are pretty comparable, due to the 1080p screen resolution and both are near the bottom of our list. The older T-Rex test churns out about 15 frames and the newer Manhattan, almost 6 fps. This is more than enough for most casual games, but heavier titles probably won't runs as smoothly as possible. So that's with the Oppo R7 and Oppo R7 Plus for now. We were left with all but positive impressions of both phones we can't wait to get proper review units.